Truth time. A little secret from me to you: I really didn’t understand what “going viral” meant until maybe last year. Using my brain and what we call “contextual clues,” I finally figured it out but for whatever reason the term didn’t click for me for some time, even though it makes logical sense. In the regular world, though, the word ‘viral’ does not bring forth positive images. 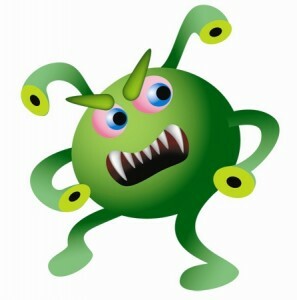 Anytime someone talks about a virus or infection or contagiousness, we want no part of it. But in social media, it’s the best thing that can ever happen to you. So basically, digital wet sneezes are a good thing. In our era of instant gratification, news and information is now spreading so fast that something even taking a few days to become popular is slow. Which is craziness! Technology has basically turned hearing about something “through the grapevine” into a competitive frenzy, where news travels at the speed of…..well, internet connectivity. Remember America’s Funniest Home Videos? I think that show is still in existence….Anyway, prior to YouTube it was the only way silly home accidents which were poorly shot could ever go viral, and even then, they didn’t guarantee that people would see them, because that would mean people would have to choose to tune in to watch Bob Saget host the show. It would have been funnier if he could have been himself instead of the cleaned up version of himself. And if you want to see the best version someone could ever possibly perform of that song, it’s when Stephen Colbert sings with Jimmy Fallon and The Roots. Go here for that piece of television magic. Three words: Evolution of Dance. I don’t even remember how I heard about this – an email forward, maybe? But it still holds up. This video was a big deal because he got a million hits on it and that was before a million was no big thing. This next one is by the infamous Alexandra Wallace who made a racist rant about Asians in the library at UCLA. The backlash was incredibly funny. She had no idea that her ignorant decision to make fun of a singular group of people would end up forcing her out of her own school. An ABC After School Special could have told her that. And here’s the response to her rant (my personal favorite) by the talented Jimmy Wong. Warning: his song will get stuck in your head! But in a good way. And last but not least, we have The Bed Intruder Song. A couple of guys took Auto Tune and made an interview with a “regular Joe” from the projects into a national sensation. Ke$ha should give them a call since they clearly know how better to use Auto Tune than she. This thing blew up and a full version was released on iTunes. I may or may not have purchased the ring tone. So basically, you either have to be incredibly talented or incredibly dumb to have something go viral. I’m happy to say that out of the examples I mentioned, only one was due to stupidity. Alexandra, I hope you’re in a better place, honey. Did you enjoy my piece on viral marketing today? Please be sure to hit any one of the sharing icons below this post to let me know that you did.